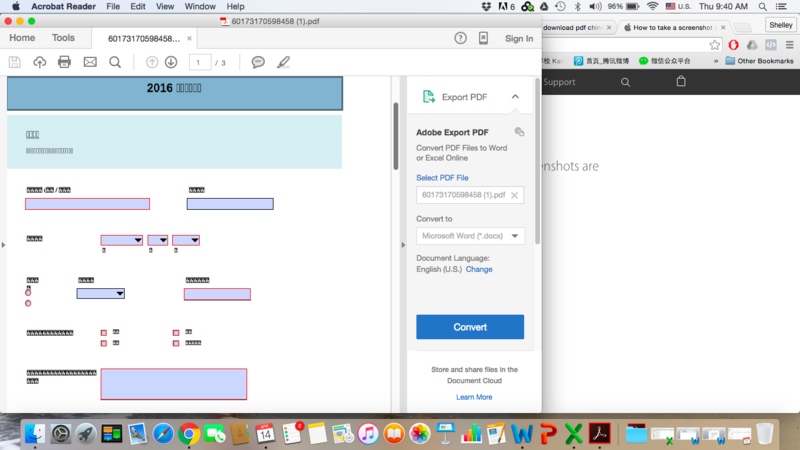 The pdf version downloaded has unreadable characters - how to fix this as I need to use PDF because the online version is slow to submit in China (connectivity issues). I am using mac in case that makes a difference. That may have something to do with your Adobe reader's unicode or language settings. With that you will need to download the language pack for your reader in order to be able to print the proper characters. If you have Google Chrome browser installed, you can drag the file there and let the PDF load on the browser. Normally, Chrome has the proper unicode settings set on the browser that should automatically read non-English characters. It seems like I have the most up to date version of Acrobat Reader DC and I tried dragging the PDF to Chrome but its still the same. When forms with non-English characters gets converted to PDF format, is there any other settings that might cause the unreadable text? I tried to do the equal things; but the result is the same for both methods. According to my investigations, our fillable PDF forms is not supporting Chinese unicode currently, that's why you are monitoring the fonts "undefined" on your form when it's in PDF format. So, it's not possible to do that at the moment, sorry to say that.